More Life Esidimeni missing patients have been found by the Gauteng Health Department. MEC Gwen Ramokgopa visited some of the families on Sunday. The last count had indicated that 48 patients were unaccounted for by the end of the Arbitration Hearings. 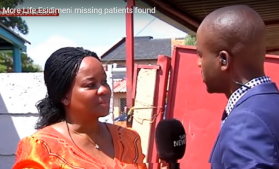 The post More Life Esidimeni patients found appeared first on SABC News – Breaking news, special reports, world, business, sport coverage of all South African current events. Africa's news leader..